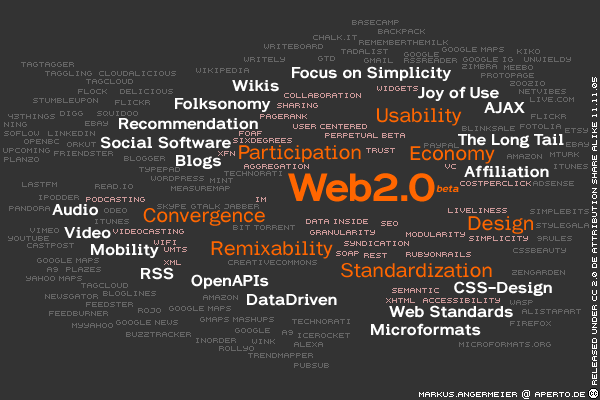 What Makes the Web 2.0? I’ve been trying to get a survey paper published titled ‘Emerging Technologies and Web Accessibility: Research Challenges and Opportunities’ but to no avail. It seems it is not useful for accessibility – or the technical details are ‘too’ technical; what have we come to. Anyhow I thought that I’d publish an extract here instead. This is a technological review article focused on identifying both the research challenges and opportunities for further investigation arising from emerging technologies. It is specifically focused on blind and partially sighted World Wide Web (Web) users along with others who use intermediary assistive technologies. The Web is a fast moving interdisciplinary domain in which new technologies, techniques, and research is in perpetual development. It is often difficult to keep abreast and maintain a holistic view of new developments within the multiple domains which together make up the Web. This suggests that a knowledge of the current developments, and predictions of future developments, in these other domains are additionally important for the accessibility community. Web accessibility has previously been characterised by the correction of our past mistakes to make the current Web fulfil the original Web vision of access for all. Previously, when new aspects of the Web were emerging, enough consideration was not given to their accessibility from the outset. New technologies were not designed with accessibility in mind and technologies that could be useful for addressing accessibility issues were not identified or adopted by the accessibility community. We wish to enable the research community to undertake preventative measures and proactively address challenges, while recognising opportunities, before they become unpreventable or require retrospective technological enhancement. This article then, is based on my personal view of emerging trends within the Web and Web Accessibility domains. There is no precise definition of the Web-2.0 (Shadbolt et al. , 2006) and in fact there is some controversy sur- rounding definitions (White, 2006). Remember, today’s Web is qualitatively different from the Web created a decade ago and we can say that the term Web-2.0 is used to emphasise this evolution in a software versioning style. As O’Reilly (O’Reilly & Battelle, 2005) who coined the term, highlights “there is no hard boundary for the definition of this term”. However, we can say that documents, once created from a single source and delivering static client-side content, are now evolving into composite documents created from multiple third party sources delivering dynamically changing information streams, or independently updating micro-content. In reality, Ajax technology is the main unifying factor which facilitates the creation of Mashups, Rich Internet Applica- tions, and Web Applications. We do not intend to discuss Ajax across the next application layers, however, it is self- evident that without Ajax, Mashups and Rich Internet Applications would be very difficult to achieve and Web Applica- tions would be all but impossible. The move to hybrid mashed-up documents may come with a corresponding increase in the cognitive load required for Web interaction, this increase will be magnified for assistive technology users. This area must also be a key accessibility focus in the coming years. Web applications look to become a mainstay of the Web into the future. Indeed, their delivery may solve many problems of use associated with low-income disabled users. But, without being accessible (see Challenges and Opportunities 1 and 2) large percentages of these user groups will be excluded. Rich media content (RMC) describes a whole range of interactive digital media that exhibit dynamic motion (Chang et al. , 2008). This media presents video, audio, and animation in different formats, that are often not Web standard, and require specific media players to interact with the user (Rocha et al. , 2005). In this case these additional user agents and their content must also be accessible otherwise disabled users are presented with additional problems when interacting with the content. Used appropriately rich media can enhance the user experience for most, and be interaction neutral for the rest. However, problems often exist in that content is not correctly created, Web pages are just used as wrappers to allow transmission of large graphical presentations (as opposed to being additions to the standard Web content), and because user agents which run the specific contents are not accessible. While Web standard graphic content in the form of GIF, JPEG, PNG, are common ways of displaying static images rich media often relies on non-standard formats being embedded into (X)HTML. These include audio-visual formats, such as Quicktime (MPEG-4), RealMedia, and Windows Media, along with audio only formats such as WAV, MPEG, and AAC, and are often embedded as ‘streaming’ content. Lately, Scalar Vector Graphics (SVG) (Murphy, 2005; Jackson, 2002), a family of XML specifications for describing 2D vector graphics, both static and dynamic, interactive and animated, has become the exception in which images and their behaviours are defined in XML text files. This means that they can be searched, indexed, scripted, compressed, and edited which a text editor. These formats are rich from a presentation perspective but are ‘push’ content in that there is no other interactivity except for the presentation. While there is a Web standard compliant language for audio-visual presentation, the Synchronised Multimedia Integration Language (SMIL), it only provides a co-ordination engine to mediate between different multimedia streams. The most common rich media format that provides interactivity is Sun’s Java Applets, Microsoft’s ActiveX, Netscape’s LiveConnect, and Flash by Adobe, formally Macromedia, which along with Adobe Acrobat forms and eBooks account for much of the truly interactive content on the Web. While some limited work is underway on overcoming the presentation and interactivity problems inherent in rich content this is focused on mainly on Flash and is still at a very preliminary stage (Miyashita et al. , 2007). While, development of new accessibility standards are continuing in the guise of IAccessible2, by the Free Standards Group Accessibility Workgroup (FSGA) and the Open Accessibility (A11y) Group; now subsumed within the Linux Foundation, Java Applets have had an accessibility API for sometime, and ActiveX along with LiveConnect also have some accessibility components, deficiencies do still exist. We see the Mashup, the Rich Internet Applications, and the Web Applications as a continuum built on technologies which come under the Ajax umbrella; remember Ajax is really a concept as opposed to a specific technology. A Mashup then, often enables the Web developer to pull in content from different sources and facilitate rudimentary orchestration of that content. A Rich Internet Applications on the other-hand normally uses Ajax as a way of facilitating the user through a series of more complicated tasks and facilitates a more complex orchestration of the content and associated tasks. Finally, we see Web Applications as task based functionality built on the Web with the abilities of desktop applications and, when using windowless browsing, become all but indistinguishable from a standalone desktop application. A Mashup then, is a Web page that combines data or functionality from two or more external sources to create a new service. Mashups use the same kind of asynchronous methods as are found in Ajax (see § 1.1.2), normally layered with inter-component communication and synchronisation functionality (Sire et al. , 2009) so that each source returns relevant information to the others (Le-Phuoc et al. , 2009). Mashups use Web Application Programming Interfaces (API) and Representational State Transfer (REST / RESTful) interfaces provided by different content sites to aggregate and reuse the content in different ways; REST being a style of software architecture for distributed systems such as the Web. Therefore, individual content may be combined in any manner, resulting in arbitrarily structured hybrid content (Ennals et al. , 2007). In more recent mashup scenarios Service-oriented Architectures (SOA) (N. et al. , 2009) are adapted to enhance the older API facing components with Web Service based interfaces. Mashups are difficult to objectively classify as they can take the form of composite applications with a light layer of communication synchronising each component. They can also be, more or less a portal, a page which just collects together a number of components in the same physical location. Even if each component provides some degree of accessibility functionality, it does not follow that the inter-component communication, or the page based user inter- face, which controls this communication and therefore the component group, will be accessible (Lin et al. , 2009). This can work in the reverse too; the mashup page may be accessible but the components may be inaccessible. This being the case each component may be though of as a separate user agent and therefore inaccessibility would mean non-compliance to the Web Accessibility Initiative guidelines. Web applications (Web app or Webapp) are Web based applications popular with users due to the ubiquity of the browser as a client (thin client). The ability to update and maintain Web applications without distributing and installing software on potentially thousands of client computers is a key reason for their popularity with software de- velopers (Baresi & Morasca, 2007). Older Web applications are used to implement Webmail, online retail sales, online auctions, wikis, discussion boards, and Weblogs. With the advent of Rich Media and Ajax these Web applications are changing to become more desktop-like with word-processors such as ‘Zoho Writer’ and spreadsheet applications such as ‘Num Sum’. However, along with this extra functionality comes a bar to accessibility from the technologies and interaction model these applications present to the user. The Web application scenario is further complicated by ‘widgets’, reusable Graphical User Interface (GUI) code that can be installed into any (X)HTML Web page by a developer without requiring additional compilation. Widgets, often render visual components to look similar to standard desktop GUIs. However, without the richness of the programmatic environment interactive (X)HTML components are visually rendering without the correct semantics (such as hierarchical trees). Accessibility is therefore lost as there are no, non-visual, familiar concepts contained within the widget (Di Lucca et al. , 2006). It is obvious that the current interaction model of the Web, as used by assistive technologies, is changing. Further, that this change is starting to increase at such a rate that without timely and prompt action blind users will be barred from using this ‘new’ Web. Current access technology assumes a static interaction model, and expects that once the audio rendering has been performed no other changes to content already spoken will occur. This assumption is fundamentally flawed when dealing with Ajax sites and technologies. This is because the applications embedded through the static content are constantly and dynamically updating. Currently, the designer dictates how an Ajax update via ARIA should be spoken (whether it can wait, say, or must be spoken immediately) however, this does not account for choice via the user agent. While ARIA may provide a programmatic solution many problems still exist centred around the likelihood of widespread ARIA adoption, retrofitting legacy Ajax sites, and user choice on the client-side (Zucker, 2007). Ajax support is probably one of the most pressing areas for accessibility work at present. Indeed, without change the Web will increasingly become inaccessible to many disabled users. Without question the development of rich media content is a direct barrier to Web users who rely on intermediate technologies. It often however, is a direct benefit to cognitively impaired Web users. However, the main barrier is that mostly information is missing from the A/V stream and so user agents cannot present information in an appropriate format. The presence of a multiple form of audio visual (A/V) presentation should imply a uniformity of experience. However, A/V does imply certain barriers as descriptions of the visual elements are not related in audio, and descriptions of the audio component are not translated to sign language or subtitles. By ignoring these glaring inadequacies large areas of the most used Web will be lost to disabled users. As the number of formats and embedding technologies increases how can accessibility be maintained? How is keyboard focus management going to be implemented consistently across Web applications, operating systems and browsers? What are user interface implications of notifying users of content dynamically changing and not overwhelming the speech users (management of user attention)? How will HTML5 and ARIA be integrated to provide a consistent and predictable coding patterns for accessibility? How can accessible components and accessible communications between these components be assured? Is there a limit of the number of components that can be handled in an accessible interaction? accessibility questions of Web applications? Are widgets set to become more pervasive and if so how will accessibility be handled? Will automatic analysis of the different streams enable cross-disability accessibility? Is it feasible to automatically generate captioning and sign language? Can we dynamically generate ARIA on the client-side based on the delivered content? There are few interaction problems when delivering these mashed-up sources visually. The real problems arise due to the underlying incoherent nature of the interaction model and the hybrid documents it creates. Changes in context and multiple dynamic updates all compete for the users’ attention, producing an incoherent cacophony if the delivery is in audio or if the user has cognitive disabilities. Consequently, naive one-shot sensory translation can no longer support the user. However, mashups can be tailored for certain users and user groups, and in this case there are opportunities for accessibility. We can see this very opportunity in the accessible ‘YouTube’ mashup, which uses Web Services to build an accessible interface for users with a learning disability (Hyde, 2008). If the move from the desktop to the Web continues unchecked, we will start to see users increasingly barred from using Web based applications (Jeschke et al. , 2009). This is because the Web interface is generated without reference to the coded widgets of desktop applications. This Web interface really relies on graphically augmented hyper-links and micro-content updates. Hot Keys and tabbing do not work correctly, menus and toolbars are no more than lists of hyper-links without groups or orientations and no more semantics than a standard link (Leventhal, 2006). The machinery required to make a graphical user interface accessible is huge and specific (Freire et al. , 2007). Without this machinery Web Applications cannot become accessible. Baresi, Luciano, & Morasca, Sandro. 2007. Three empirical studies on estimating the design effort of Web applications. ACM Trans. Softw. Eng. Methodol., 16(4), 15. Chang, Edward, Ong, Ken, Boll, Susanne, & Ma, Wei-Ying. 2008. Rich media and web 2.0. Pages 1259–1260 of: WWW ’08: Proceeding of the 17th international conference on World Wide Web. New York, NY, USA: ACM. Chen, Charles L., & Raman, T. V. 2008. AxsJAX: a talking translation bot using google IM: bringing web-2.0 applications to life. Pages 54–56 of: W4A ’08: Proceedings of the 2008 international cross-disciplinaryconference on Web accessibility (W4A). New York, NY, USA: ACM. Cooper, Michael. 2007. Accessibility of emerging rich web technologies: web 2.0 and the semantic web. Pages93–98 of: W4A ’07: Proceedings of the 2007 international cross-disciplinary conference on Web accessibility (W4A). New York, NY, USA: ACM. Di Lucca, Giuseppe Antonio, Distante, Damiano, & Bernardi, Mario Luca. 2006. Recovering conceptual models from web applications. Pages 113–120 of: SIGDOC ’06: Proceedings of the 24th annual ACM international conference on Design of communication. New York, NY, USA: ACM. Ennals, Rob, Brewer, Eric, Garofalakis, Minos, Shadle, Michael, & Gandhi, Prashant. 2007. Intel Mash Maker: join the web. SIGMOD Rec., 36(4), 27–33. Freire, Andre Pimenta, Goularte, Rudinei, & de Mattos Fortes, Renata Pontin. 2007. Techniques for developing more accessible web applications: a survey towards a process classification. Pages 162–169 of: SIGDOC ’07: Proceedings of the 25th annual ACM international conference on Design of communication. New York, NY, USA: ACM. Gibson, Becky. 2007. Enabling an accessible web 2.0. Pages 1–6 of: W4A ’07: Proceedings of the 2007 international cross-disciplinary conference on Web accessibility (W4A). New York, NY, USA: ACM. Hyde, Antonia. 2008 (September). Easy YouTube. http://icant.co.uk/easy-youtube/ and http://scriptingenabled.org/2008/10/easy-youtube-and-learning-disabilities/ Last Checked: November, 2009. Jackson, Dean. 2002. Scalable vector graphics (SVG): the world wide web consortium’s recommendation for high quality web graphics. Pages 319–319 of: SIGGRAPH ’02: ACM SIGGRAPH 2002 conference abstracts and applications. New York, NY, USA: ACM. Jeschke, Sabina, Pfeiffer, Olivier, & Vieritz, Helmut. 2009. Using web accessibility patterns for web application development. Pages 129–135 of: SAC ’09: Proceedings of the 2009 ACM symposium on Applied Computing. New York, NY, USA: ACM. Le-Phuoc, Danh, Polleres, Axel, Hauswirth, Manfred, Tummarello, Giovanni, & Morbidoni, Christian. 2009. Rapid prototyping of semantic mash-ups through semantic web pipes. Pages 581–590 of: WWW ’09: Proceedings of the 18th international conference on World wide web. New York, NY, USA: ACM. Lerner, Reuven M. 2006. At the forge: Ajax application design. Linux J., 2006(152), 9. Leventhal, Aaron. 2006. Structure benefits all. Pages 33–37 of: W4A ’06: Proceedings of the 2006 international cross-disciplinary workshop on Web accessibility (W4A). New York, NY, USA: ACM. Lin, James, Wong, Jeffrey, Nichols, Jeffrey, Cypher, Allen, & Lau, Tessa A. 2009. End-user programming of mashups with vegemite. Pages 97–106 of: IUI ’09: Proceedings of the 13th international conference on Intelligent user interfaces. New York, NY, USA: ACM. Lunn, Darren, Harper, Simon, & Bechhofer, Sean. 2009. Combining SADIe and AxsJAX to improve the accessibility of web content. Pages 75–78 of: W4A ’09: Proceedings of the 2009 International Cross-Disciplinary Conference on Web Accessibililty (W4A). New York, NY, USA: ACM. Miyashita, Hisashi, Sato, Daisuke, Takagi, Hironobu, & Asakawa, Chieko. 2007. Aibrowser for multimedia: intro-ducing multimedia content accessibility for visually impaired users. Pages 91–98 of: Assets ’07: Proceedings of the 9th international ACM SIGACCESS conference on Computers and accessibility. New York, NY, USA: ACM. Murphy, Steve. 2005. Accessibility of graphics in technical documentation for the cognitive and visually impaired. Pages 12–17 of: SIGDOC ’05: Proceedings of the 23rd annual international conference on Design of communication. New York, NY, USA: ACM. N., Kanakalata, Banerjee, Udayan, & Kumar, Shantha. 2009. Performance optimization of SOA based AJAX application. Pages 89–94 of: ISEC ’09: Proceeding of the 2nd annual conference on India software engineering conference. New York, NY, USA: ACM. O’Reilly, Tim, & Battelle, John. 2005 (September). What Is Web 2.0: Design Patterns and Business Models for the Next Generation of Software. http://www.oreillynet.com/lpt/a/6228, Last Viewed 01/03/2010. Petreley, Nicholas. 2007. Ajax simplified. Linux J., 2007(157), 1. Rocha, Marcus, Maia, Marcelo, Cunha, ́Italo, Almeida, Jussara, & Campos, S ́ergio. 2005. Scalable media streaming to interactive users. Pages 966–975 of: MULTIMEDIA ’05: Proceedings of the 13th annual ACM international conference on Multimedia. New York, NY, USA: ACM. Shadbolt, Nigel, Berners-Lee, Tim, Hendler, Jim, Hart, Claire, & Benjamins, Richard. 2006. The next wave of the web. Pages 750–750 of: WWW ’06: Proceedings of the 15th international conference on World Wide Web. ACM Press. Sire, St ́ephane, Paquier, Mica ̈el, Vagner, Alain, & Bogaerts, J ́erˆome. 2009. A messaging API for inter-widgets communication. Pages 1115–1116 of: WWW ’09: Proceedings of the 18th international conference on World wide web. New York, NY, USA: ACM. Thiessen, Peter, & Chen, Charles. 2007. Ajax live regions: chat as a case example. Pages 7–14 of: W4A ’07: Proceedings of the 2007 international cross-disciplinary conference on Web accessibility (W4A). New York, NY, USA: ACM. White, Bebo. 2006. The Implications of Web 2.0 on Web Information Systems. In: WEBIST (1). Zucker, Daniel F. 2007. What does AJAX mean for you? interactions, 14(5), 10–12. Hello Simon, is it possible to have your complete version of the paper? I’m working on a spanish research project called INREDIS [http://www.inredis.es] and I’m very interested on the topics that you are talking about.